For all the strides being made in hydrogen fuel cell transportation, we are still a long, long way from having hydrogen form a central pillar in our energy infrastructure. What would the UK look like with a hydrogen based transport sector? Is it even possible, let alone feasible? To try and answer that question, a partnership between engineering and business researchers at Imperial College have produced a 30 page analysis entitled ‘Optimal design and operation of integrated wind-hydrogen-electricity networks for decarbonising the domestic transport sector in Great Britain’, published in this month’s International Journal of Hydrogen Energy. 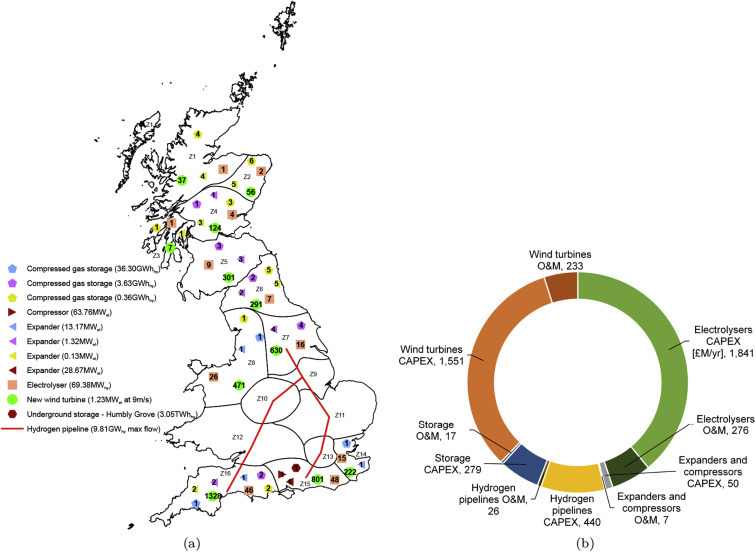 Results indicate that all of Britain’s domestic transport demand can be met by on-shore wind through appropriately designed and operated hydrogen-electricity networks. Within the set of technologies considered, the optimal solution is: to build a hydrogen pipeline network in the south of England and Wales; to supply the Midlands and Greater London with hydrogen from the pipeline network alone; to use Humbly Grove underground storage for seasonal storage and pressurised vessels at different locations for hourly balancing as well as seasonal storage; for Northern Wales, Northern England and Scotland to be self-sufficient, generating and storing all of the hydrogen locally. These results may change with the inclusion of more technologies, such as electricity storage and electric vehicles. The envisioned pipeline, indicated by the red line across the south of England in the figure above, would be needed to supply the UK’s southern urban centres. How much would all this cost? The modellers have suggested £17.1 bn/yr once the infrastructure is up and running, itself budgeted at £4.7 billion. This includes the use of large, underground reservoirs to store hydrogen in winter, when demand is lowest, and release it out during the summer months. Without storage reservoirs, the estimated cost of the network rises by 25% to meet peak demand. Such a radical overhaul of the UKs transport and energy sectors is unlikely in the short term, to say the least, but such concrete proposals give policymakers a starting point to consider the matter more seriously. To see the full list of assumptions, calculations and conclusions in the model, you can read the full paper at the International Journal of Hydrogen Energy here. 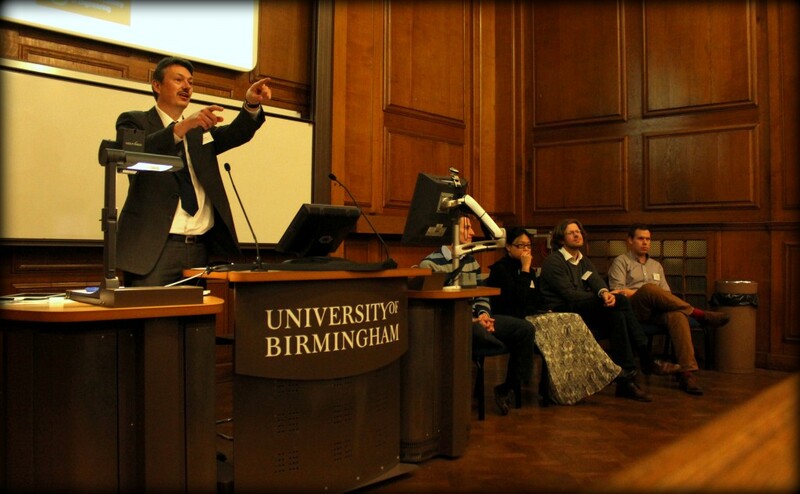 One hundred and eighty three Hydrogen and Fuel Cell Researchers descended on the Chemical Engineering Department at the University of Birmingham earlier this week for the ‘first of its kind event’ that centred around early career researchers, postdocs and PhD students in the field. The event that ran from Monday 16th-Wednesday 18th December, consisted of presentations from prestigious keynote speakers from both academia and industry, a passionate panel discussion with newly appointed academics, 23 presentations from PhD students and PostDocs, several poster sessions with over 90 posters and of course a conference dinner that took place at the nearby Edgbaston Cricket Stadium. Yesterday saw the signing of a new Memorandum of Understanding (MoU) in Hydrogen & Fuel Cells at Lancaster House, in which H2FC SUPERGEN represented the Uk’s Hydrogen and Fuel Cell research comminity. The signing of the agreement was witnessed by Edward Davey, Secretary of State for the Department Energy and Climate Change and was brought about to strengthen cooperation between the UK and South Korea in the fields of hydrogen and fuel cells. To help prioritise areas for collaboration between the UK and Korea, a roundtable discussion will take place on Nov 6th at Imperial College London. We anticipate that funding agencies from both the UK and Korea will be present, alongside key industrialists and academics from both countries. Please contact Dr Chloe Stockford (c.stockford@imperial.ac.uk) to attend and for more information.